The push to legalize marijuana for recreational use is gaining momentum in New York. Democratic gubernatorial candidate Cynthia Nixon is pushing for it, Gov. Andrew Cuomo has signaled that he is open to it and New York City Mayor Bill de Blasio has concluded that it is inevitable. Much of this drive appears to come from a social justice campaign to end racial disparities in arrests for marijuana offenses. Nixon made that clear in her campaign video. De Blasio’s new position, which included a demand that the NYPD stop making arrests for smoking marijuana in public, came after reports of enforcement disproportionately affecting black and Latino residents. But changes could remove or ease restrictions on medical marijuana in New York and might even help to curb the state’s opioid epidemic. New York has a medical marijuana program, but it is more restrictive than in other states. For instance, a person must be diagnosed with a qualifying condition. While that list was recently expanded to include post-traumatic stress disorder, a patient must still have a “severe, debilitating or life-threatening” condition, which leaves out many others who may benefit from medical marijuana. Recreational marijuana has recently been high on the list of priorities for New York politicians. Democratic gubernatorial candidate Cynthia Nixon has made legalization an important part of her campaign, while Gov. Andrew Cuomo’s opinions seem to be evolving. The Republican gubernatorial candidates, Dutchess County Executive Marc Molinaro and state Sen. John DeFrancisco, did not return requests for comment on their positions on recreational marijuana, although DeFrancisco did vote against the bill which legalized medical marijuana in New York in 2014. Meanwhile, legislation is under consideration in the state Legislature that would legalize recreational marijuana, although it faces stiff opposition. In honor of 4/20, here is an in the weed(s) look at the politicians who are blazing the trail for legalizing recreational marijuana in New York, and the ones who are harshing the mellow. The long-time chairman of the Assembly Health Committee is a staunch advocate of making marijuana more accessible. He helped to write the law which legalized medical marijuana in the state for a narrow set of conditions and does not allow patients to smoke it but imbibe through other means, but has criticized it for being too restrictive. He has introduced legislation to allow people to smoke marijuana and to loosen the restrictions on which afflictions qualify for medical marijuana use. Gottfried is also an Assembly sponsor of the Marijuana Taxation and Regulation Act. This bill would legalize marijuana for adults over 21, which Gottfried has said is “long overdue” in New York. Seven lawmakers are pushing for the Manhattan district attorney to withdraw from a controversial policy in which the NYPD was given authority to prosecute activists in summons cases, the Daily News has learned. 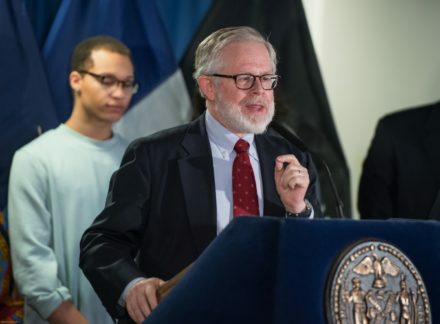 Assemblyman Dan Quart (D-Manhattan) and colleagues are urging DA Cy Vance Jr. to rescind his delegation of violations to the NYPD’s Legal Bureau — a policy that allows department lawyers to play prosecutor in summons court. The collective, in a sharply worded letter to be delivered Tuesday, is asking Vance to “rescind” the permission he gave to the department in a February 2016 agreement. It is the subject of a lawsuit following the 2016 protest arrests of two Black Lives Matter activists. The police department sought the access to the low-level court proceedings — that are not even usually handled by a prosecutor — as a way to try to minimize potential future exposure in lawsuits, The News previously reported. Vance has “made himself and his office into an appendage for insulating the NYPD from civil liability,” Quart charged Monday. The letter is endorsed by assembly members Inez Dickens, Daniel O’Donnell, Rebecca Seawright, Robert Rodriguez and Richard Gottfried; Sen. Liz Krueger and City Councilmember Carlina Rivera.